Oca has an extremely wide range of colors and color combinations! 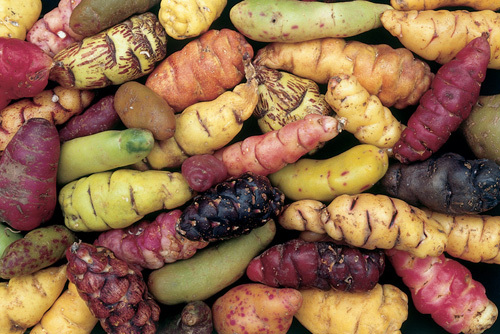 This beautiful tuber from the Andes mountains is starting to become a trendy specialty crop. Personally, I’ve only ever seen Oca for sale in German grocery stores, but from what I have read, it is becoming more popular all over the world. It is productive, has almost no diseases or pests outside its native range, and they are actually very easy to grow if you live in a temperate climate and grow certain varieties. In cold climates, they may need to be replanted annually, like garlic or potatoes. 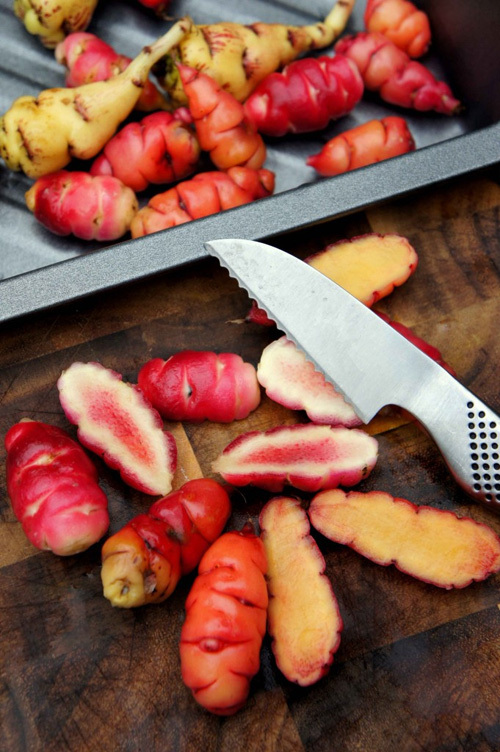 Oca makes a great addition to any vegetable or Forest Garden. Native and widespread in the central and southern Andes mountains for centuries. It is second to potato as the most important root crop in the central Andes. It has been cultivated for so long, that no wild plant exists anymore. It spread to Europe in 1830 and to New Zealand by 1860. While it became, and remained, popular in New Zealand (hence the name “New Zealand Yam”), it never really caught on in Europe. 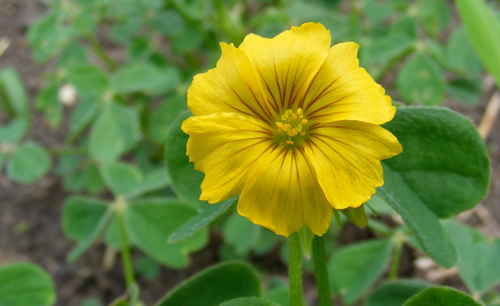 However, recently it has been gaining in popularity quite a bit, and people in temperate climates all over the world are starting trials with Oca. 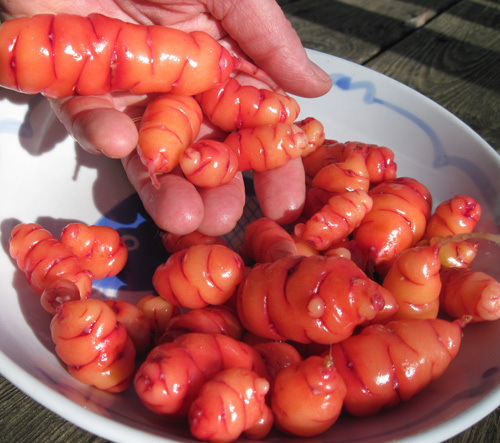 Oca can be eaten raw or cooked. 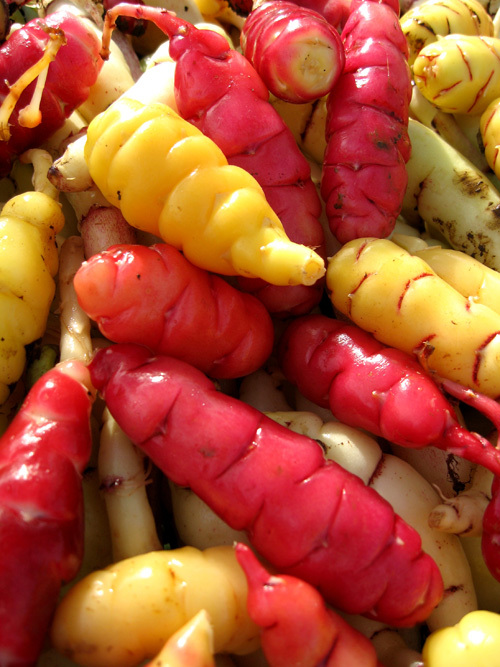 Oca tubers can be white, cream, yellow, orange, pink, red, or purple depending on the variety. A pink, waxy-skinned variety is becoming quite popular around the world, and is known as New Zealand Yam. Some plants can form aerial tubers which can be picked and planted. They are typically too small and produced to randomly to be harvested as a crop. A mission for variety development, maybe? Edible Tubers – Can be eaten raw or cooked. Tart and tangy (lemony?) when raw, it doesn’t need to be peeled when eaten raw. It will sweeten if allowed to dry out in the sun. Some varieties are very tart, and some are so sweet after drying that they are said to taste like dried figs. Can be cooked (baked, boiled, roasted, fried, mashed, etc.) like potatoes, and Oca will become more starchy and “nutty” the longer it is cooked.. 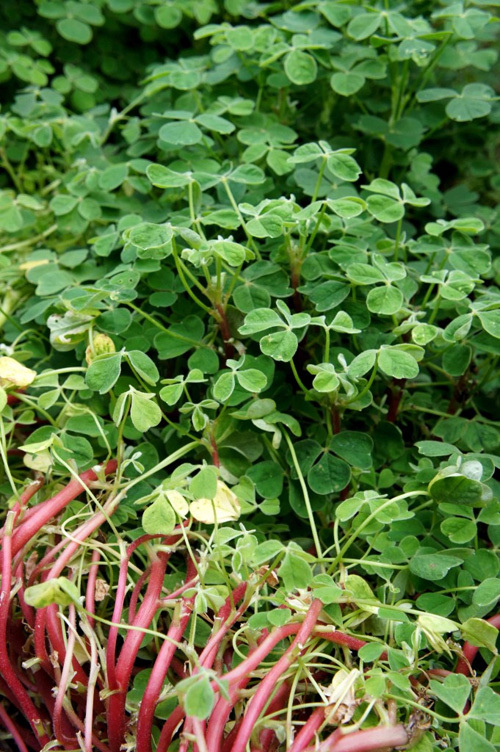 Edible Shoots – Use when young. No other information available. Edible Leaves – Use when young, raw or cooked. Tart when raw. Mild when cooked. Edible Flowers – No specific information can be found. Flour – the dried tubers can be ground into a powder and is used to make porridges and desserts. There is very little information on how it is used or if it can be mixed well with other flours. Yield: Variable. Small scale: about 50 tubers per plant. Large scale: Typical production is 7-10 tons/hectare (roughly 2-8-4 tons/acre). But with very intensive methods, 35-55 tons/hectare (14-22 tons/acre) has been achieved. Harvesting: Similar to potatoes. Harvested after tuber production has stopped – this all depends on location. If you have harsh Winters, harvesting is likely to occur in late Autumn. If you have mild Winters, harvesting is likely in Winter or even Spring. Storage: Use shoots and leaves right away (may store for a day or two in the refrigerator, but no reliable information can be found). Tubers are stored similar to potatoes. Don’t wash them, just brush the dirt off (wash before eating/cooking!) They can store for quite a long time in cool, dry locations (don’t worry about light). If the tuber has been dried in the sun, the storage life is increased. Flower is uncommon, but may open the door to new, more cold-tolerant varieties. The stems and leaves are beautiful as well making Oca an ornamental addition to the garden. Chill Requirement: Possible considering where this plant originates, but no reliable information is available. Pollination: Self-fertile. Pollinated by insects. Years of Useful Life: No good information available as we typically harvest tubers and eat them. 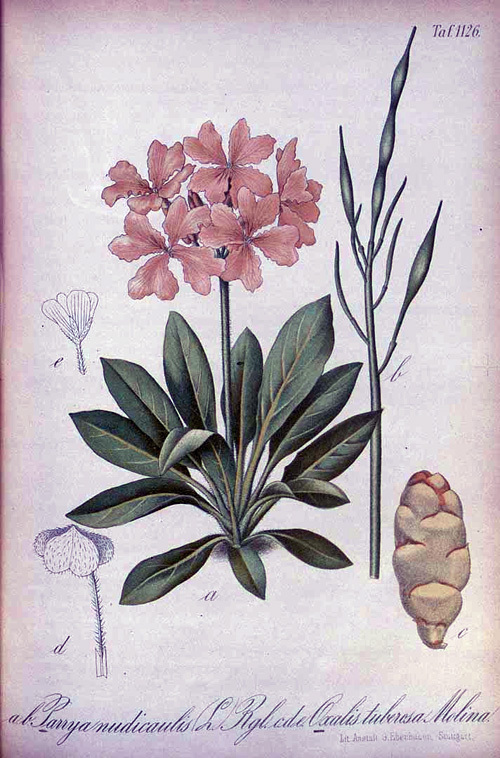 Considering that the plants can be propagated from tuber division, an individual’s life span is likely irrelevant. 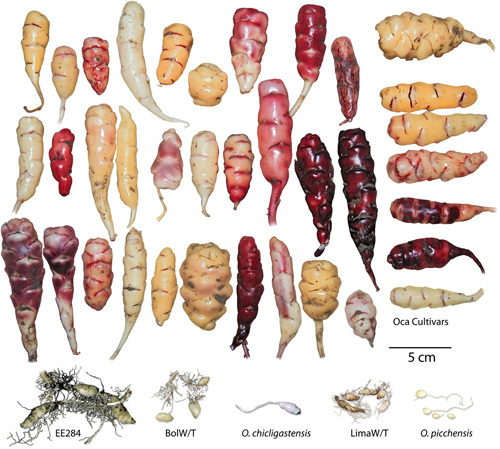 A chart showing just some of the variety of Oca tubers. The bottom row are possible wild-type ancestors to this developed plant. Tuber development is light-dependant. When daylight hours drop (in Winter), the tuber formation begins. But since the plant can only withstand so much frost, the size of the tuber will greatly depend on shorter days but less freezing. Proper location is important. There are some varieties that are day-length neutral, and these will be the ones to use if you live in a colder location, but they are hard to find right now. Again, a great area for more research and development. Or you can keep them outside in Spring and Summer, and bring them into a glasshouse when frosts are imminent. Typically from tuber divisions. Harvest in late Autumn after the top growth has died back. Large tubers are used for food, and small tubers are saved for next season. Store the tubers in a cool, dry location for the Winter. Some tubers will start to sprout as temperatures warm. Plant the tubers, in place, in Spring. 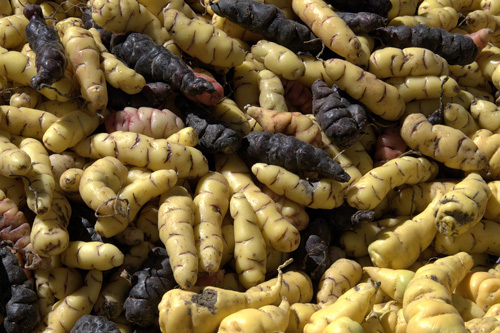 Oca can be propagated by seed, but this is very uncommon, and it is not easy to do. Can also be propagated via basal cuttings in Spring. When the shoot is 3-4 inches (8-10 cm) tall, the shoot can be cut below the soil line. The cutting is placed in good soil or growing medium and kept moist until well rooted. They are planted out, in place, in Summer. 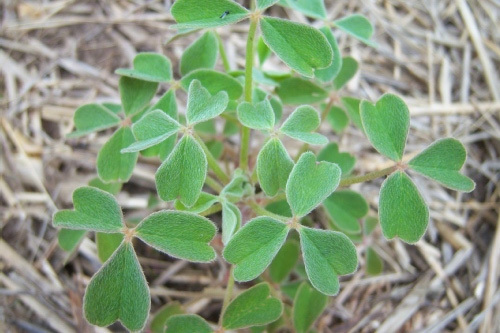 Minimal as Oca has few pests and diseases outside its natural range. 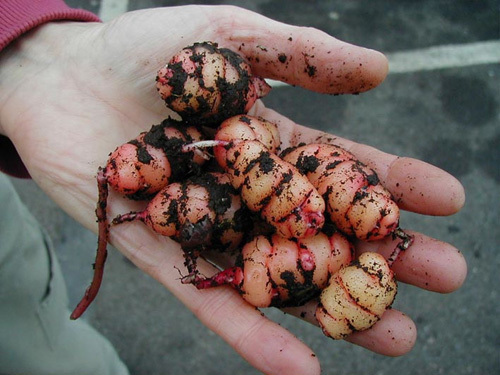 Mounding up the soil (“earthing up”) over the growing tubers can increase tuber size. It is no surprise, considering its scientific name, that Oca contains oxalic acid. This is what gives the plants their sharp flavor. In small amounts, this is no problem. If they are consumed in large amounts or eaten by people with known oxalic acid issues (gout, kidney stones, etc. ), then reversible, but serious, medical problems could result. Eat in moderation. Cooking will greatly reduce the oxalic acid content as well. 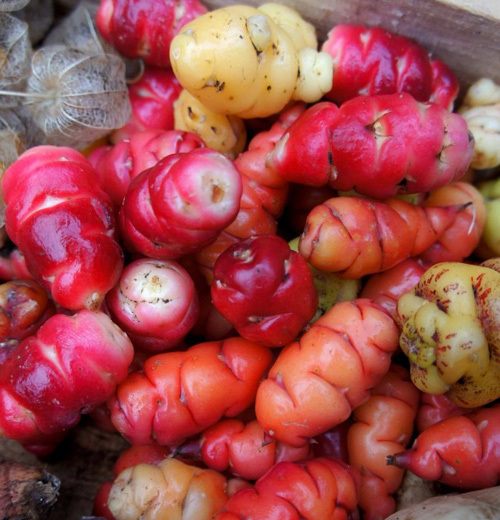 Some varieties are known as “sour oca”, and these likely have more oxalic acid than the ones known as “sweet oca”.